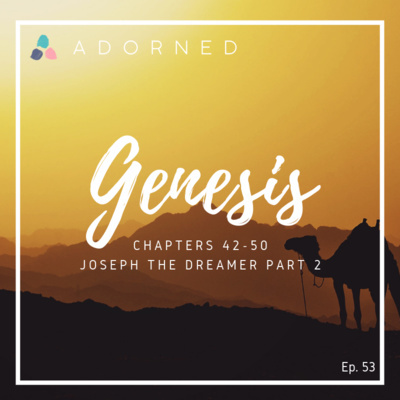 On episode 53 we wrap up the book of Genesis with a discussion on chapters 42-50. What a beautiful picture of reconciliation is seen when Joseph reveals his true identity to his brothers and tells them not to worry because what they meant for evil, God meant for good. Joseph is also reunited with his father, Jacob. What an incredible moment that must have been for both of them! It’s easy to wonder why Joseph was continually at peace when his circumstances were less than ideal. How was he able to offer forgiveness to his brothers who caused him so much pain? These things were true of Joseph because of his solid theology. Because he was grounded in who God is, Joseph was able to fully rest and trust in the sovereignty of God. Welcome to the Adorned Podcast hosted by Erin & Kacie. Our desire is to encourage women to cultivate a love for the word, dispel common misconceptions, myths, and excuses when it comes to Biblical literacy and theology, and to ignite a desire to discover God’s truth for themselves. We are Erin (left) and Kacie (right) from Austin, TX. We have been friends for about 5 years, between us we have 5 girls, and we are just average moms who want to dig in and understand the Bible and who God is as well as we can! Our goal is to encourage women to cultivate a love for the Word. We want to help people dispel common misconceptions, myths, and excuses when it comes to Biblical literacy and theology and ignite a desire to discover God’s truth for themselves. Let's go on this journey together.